The idea that there were certain behaviors expected of guests and hosts in Anglo-Saxon England is an assumed and overlooked facet to the culture. Every scholar I’ve read only mentions hospitality in the context of kinship and revenge, without explicating what expectations were laid on hosts and guests. This oversight could be due to the lack of written laws dealing with the treatment of guests and hosts. Those ordinances, or dooms, that do survive before the twelfth century primarily deal with issues of repayment and the Church. The oral culture of the Anglo-Saxons means social expectations were implicit rather than explicit in their written legal works. Old English literature is rife with examples of guest-host relationships, so we need to understand the customs to fully understand these texts. 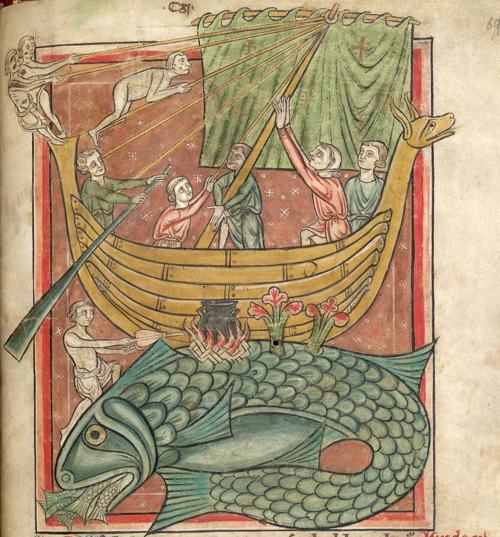 The theme of hospitality is connected to other prominent issues in Anglo-Saxon culture: exile and kinship, crime and punishment. Hosts in the literature are shown giving protection or other services to wanderers while guests provide some service in return. Either side was liable to be blamed if it brought harm down on the other. Hosts and guests acted as temporary lords and vassals, exchanging oaths to aid each other and participating in communal activities like sharing a mead cup. The study of these relationships through a lens of legality can illuminate Anglo-Saxon social norms, such as the treatment of exiles. 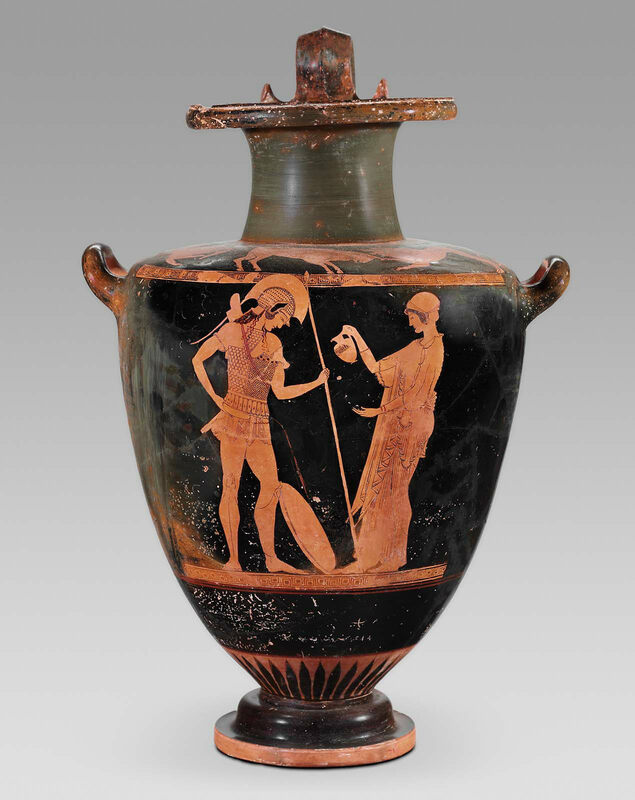 Water jar depicting a warrior and a woman making a libation, Greek 500–490 B.C. Most of the scholarship done on host-guest customs in the pre-modern world is rooted in the ancient Greek tradition. The Greeks and Anglo-Saxons, while not directly connected, share some cultural expectations of hosts and guests. For example, in Homer’s Odyssey, those gathered at the palace of Alkinoos “pour a libation to Zeus who delights in the thunder,/ and he goes together with suppliants, whose rights are sacred” (7.164-5). Guests are under Zeus’ protection. Harry L. Levy writes that houses must be generous to guests because “the stranger himself may be a god in disguise and that it is prudent to treat him well” (148). Ancient Greeks treated guests well because of the threat of divine punishment. Mistreat a god in disguise and he or she might repay you with a well-placed thunderbolt. Some social pressures are the same across cultures. The divine mandate for treating guests well also appears in Old English literature. In Andreas, the poet writes that “It is better for every man/ that he humbly receive the wandering wayfarer/ with a kind heart, as Christ commanded” (320-2). Here, as with Zeus in the Odyssey, a divinity dictates the generous treatment of guests. The Greek tradition is a useful comparison because in both Greece and Anglo-Saxon England, the correct treatment of guests was mandated by a divine authority. In other words, the best way to survive when the weather and hostile groups are against you is to band together. “Periodic scarcity” meant that the mead people drank together might be there one day and gone the next. Sharing the same mead cup implied sharing resources, sharing survival. A feud is a way of settling conflicts with bloodshed. The fact that it is a prolonged series of violent encounters might seem barbaric from our modern viewpoint, but to the Anglo-Saxons, it was an expected response to insults. That later settlements were monetary doesn’t change the fact that feuds were were an accepted method of gaining repayment for injuries and thus restoring peace. A feud was not a fault in the system but a method for preserving it. The idea that a bloody conflict was a way to keep the peace might sound contradictory until you think of the feud as a promise. Insult someone by taking advantage of their hospitality and you risk igniting a drawn-out and possibly fatal feud. In this “subsistence economy,” as Hill put it, resources were scarce. The threat of violent retribution through a feud deterred bad behavior because feuds could lead to the loss of precious resources, especially manpower. Guests were temporary members of the kin group because they were under the protection of the lord, their host. Their “temporary service” involved “kinship-like ethics,” the kind of guiding pressures expected of permanent members of the kin group. In the case of Beowulf, his killing of Grendel satisfies a feud first started with Hrothgar. Beowulf could only act as Hrothgar’s agent if he was considered, legally, to be part of the offended kin group. Not only did the Anglo-Saxons and Scandinavians frequently intermarry, but they formed temporary family bonds by taking in guests, as Hrothgar does with Beowulf. Guests were accepted into the kin group, meaning they were treated as family and were expected to behave as such. The relationship between host and guest can be likened to the binding between vassal and lord. A few existing legal clues, especially oaths, suggest similarities between the two types of relationships. Hill refers to a late Anglo-Saxon oath in which a person vows to be “loyal and true and love all that he loves and never of one’s own will or power, in words or deeds, do anything that to him is hateful” (71). This oath between vassal and lord constrains the oath-taker from saying or doing anything that harms his liege. This legal binding would have deterred host and guest from harming each other. 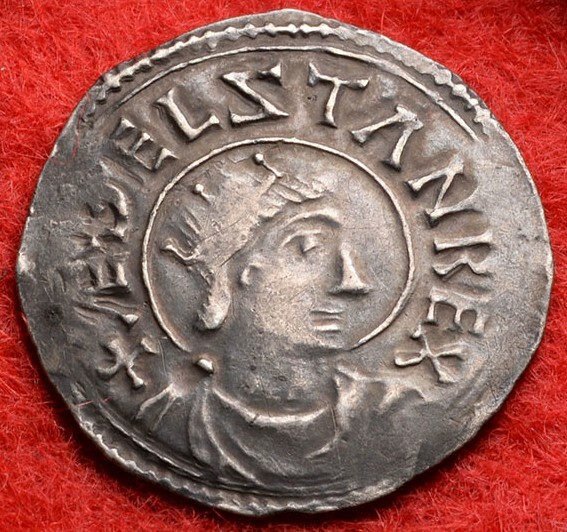 Aethelstan, a tenth-century king, produced a law document in which he discusses the importance of keeping one’s oaths: “And he who shall swear a false oath, and it be made clear against him; that he never after be oath-worthy, nor let him lie within a hallowed burial-place, though he die” (section 26). The oath between lord and vassal (and by extension, host and guest) was so sacred that any violation condemned the wrongdoer to a punishment extending into the afterlife. In “Hwanan sio fæhð aras: Defining the Feud in Beowulf,” David D. Day builds on Hill’s idea of the feud as a peacekeeping method by proposing that feuds—and all behaviors—existed in a set system, a “well known model of interaction” (9). This model dictated the behaviors expected of hosts and guests, as well as how deviations from those behaviors should be handled. Living within a model such as the one Day describes is reassuring. In Anglo-Saxon society, you needed to know if the stranger who wandered in was there to kill your family or simply needed a warm bed for the night. Oaths and a verbal challenge were necessary proof of a guest’s good intentions. that her wish had been fulfilled. who would relieve their suffering. As Hill has noted, Wealhtheow thanks God because Beowulf is a force arrived to correct the legal wrongs done by Grendel. Wealhtheow, speaking for both herself and Hrothgar, places their trust in Beowulf. He will do a service for them by killing the monster. The oath, in this case, occurs when Beowulf boasts that he will kill Grendel or die trying. Having previously reassured Hrothgar that he is not a lordless man, Beowulf announces that he will help the Danes. In return, Beowulf is sheltered and welcomed temporarily into the kin-group while he travels without his permanent kin-group. Everyone drinks of the mead cup because everyone now shares in the same fate. The guest-host relationship is an exchange, with verbal challenges serving as negotiations. In the Anglo-Saxon model, guests swear oaths and provide a service while hosts provide a kind of home away from home. The model is reinforced not just by divine mandate, as it is in ancient Greek culture, but by the need to survive. A boast between host and guest is as binding as any written contract because in Anglo-Saxon England, a drink is never just a drink. —Sara Ramey ’15 is an English major and Western European Studies (classical track) concentrator, so she can’t resist the urge to compare everything to the Odyssey. She also wrote a review of John Gardner’s Grendel.